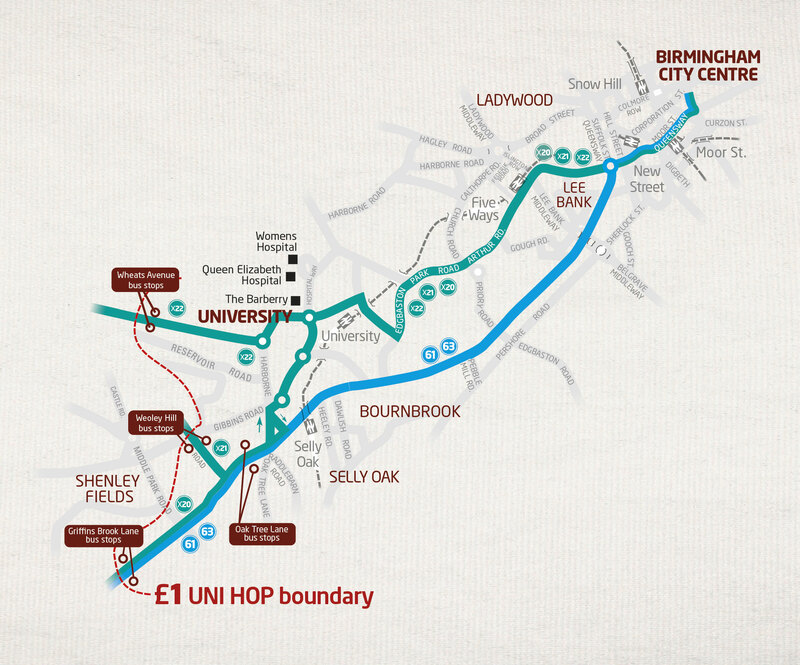 Travelling between Selly Oak and the city centre? If you're enrolled at or employed by a university, or work for the NHS, you can hop on for just £1! Our £1 Uni Hop is a single fare available for all university students and employees, and NHS staff members with a valid ID card, travelling within the Uni Hop area on services 61, 63, X20, X21 & X22. The ticket can be purchased at any stop on the below routes. Hop on the 61 or 63 to uni / QE Hospital, or pop into the city centre, with buses running up to every 5 minutes during peak times. Staying late at the library or on a night shift? Our 63 service runs throughout the night, so we'll get you'll home safe and sound. Our Platinum X20, X21 and X22 services offer premium comfort, with comfier seats, extra legroom, WiFi and USB charging points on most vehicles. These services run up to every 20 minutes during peak times and offer a limited stop service between Vincent Drive (University Station) and the city centre.